If you have not played Skunk before read the instructions below. Make yourself a copy of this five column table. 1. Everyone in the class makes a copy of the Skunk score sheet on a piece of paper. Each column is for recording the totals from a round of the game. There will be five rounds. 2. Everyone in the class stands up. 3. The teacher (or delegate) rolls the dice and everyone adds the two numbers to get the first total. 4. If a one came up on either or both dice the total is zero and this round is over. 5. If it is not zero this first total is written down in the first (S) column. 6. Now it is time to make a choice. (a) You can remain standing and add the next dice total to your existing total for round one. If however the next total is zero (because a one has appeared) you will lose everything for this round and end up with a score of zero for round one. (b) You could decide to sit down. This means you will keep the totals you have recorded so far. Your score for this round is the sum of those totals. You cannot claim any more totals or stand up again this round. For you this round has finished. 7. After a one has appeared on either dice the current round finishes and the next round begins. 8. 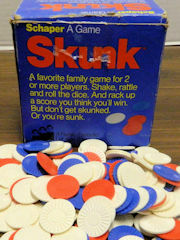 A game consists of five rounds, one for each of the letters in the word Skunk. A final score is the sum of the five scores from each of the rounds. 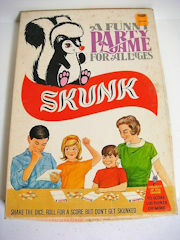 Skunk is quite an old party game but it has been adapted for use in the Maths classroom to give pupils a feel for probability and to generate discussion about the choices that the pupils make while playing the game. Originally launched in 1953 (rebranded in 1968 and 1977) by W.H. Schaper as a boxed board game. This activity is adapted from an article by Dan Brutlag, BRUTLAG, D. (1994). 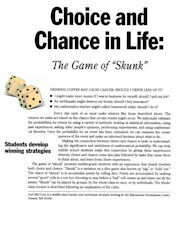 Choice and Chance in Life: The Game of "Skunk". Mathematics Teaching in the Middle School, 1(1), 28-33. 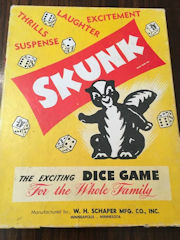 In this version of Skunk there is a choice of using one, two or three dice. Pupils could analyse the probability of a one appearing by creating a possibility space diagram. Additional Skunk resources are available here when you are signed in to your Transum subscription account. If you do not yet have an account and you are a teacher, tutor or parent you can apply for one by completing the form on the Sign Up page. The dice used in this activity have been hypnotised (programmed) not to come up with a one on the first roll of each round. If you prefer not to play with this feature untick the first checkbox below. Do not show a one on the first roll. Display totals in SKUNK table after each roll. If you would like a greater variety of dice choices you could use the Dice and Spinners collection.